Our newsroom advised readers this week in an article dated March 16, 2017 that Premier Smith was actively lobbying the United States Department of Transportation (DoT) on behalf of BVI Airways, a foreign company, in which his government pumped some $7Million of taxpayers funds into, but refused to help the local VI Airlink who had proposed to do the same thing- direct flights from Miami, Florida to the Terrance B. Lettsome International Airport. 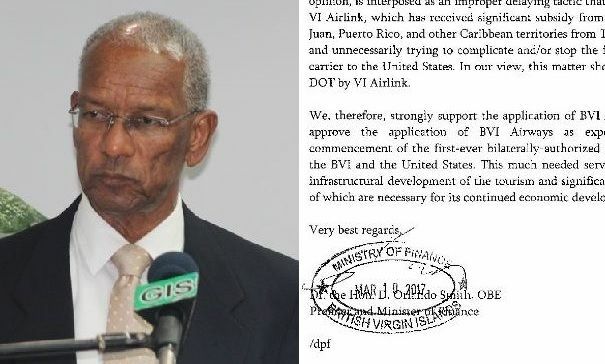 Local co-owner of VI Airlink Neville C. Braithwaite Jr, spoke out against the Premier’s action and also wrote to the DoT, along with InterCaribbean Airways, with an objection to BVI Airways application. Mr Braithwaite told our newsroom that with the $7M start-up funds given to BVI Airways they could run other local carriers out of business. Many residents, while agreeing for the need for better airlift, were surprised that Premier Smith would so actively lobby both publicly and in writing against a local business. Well our usual National Democratic Party sources have provided us with a copy of the letter the Leader of Government Business wrote to Mr Brian J. Hedberg of the US DoT, dated March 8, 2017. NDP would win by a landslid. It would be a win for then..brung it on...All this conundrum and blogs are VIP bloggers trying once again for a dismal loss. The Russians are here ... Leak Letter wow,i wonder what's next..
That no-so-Premier is Funny. Whilst he only mentions VI Airlink, it wasn't only them who filed an objection. This is definitely a personal attack on VI Airline in my opinion. Looks like the no-so-Premier is acting out of desperation because he knows he negotiated a bad contract with BVI Airways and unless they fly, government Nash get back that 7mil. How can we ever RISE with this type of Leadership who looks as us as sh#t to flush down their toilets? We are melanated people with untapped potentials beyond measures if we are given the chance, guidance, and support to RISE! Doc, you should be ashamed. If I ever needed a cup of sugar, I can always go to Mr. Brathwaite and connect with him and get that cup of sugar. What are we getting from these people we know nothing about, but their spin on helping these poor little isolated islands with our tax dollars? OH my! We will kill our own for foreign interest. Why now did VI Airlink want to stop the progress for the country? It wouldn't have been a good time before hand. What does it benefit them now or even the country. I don't now. Will BVI Airways really put other companies out of business. Maybe VI Airlink need to step up their game. Customer service goes a long why and good and competitive prices. how can they step when the vi gov keep u down. this begin in the BVI and still here. money is why the bvi people is going to fall!!!!!!!!!!!!!!!!!!!!!!!!!! here we have our sitting head of state reduced to a common or garden expatriate private lobbyist. What have we come to? Whatever happened to level playing fields? I see a government stamp! BVI Airways is a corporate name only. Mr Premier is apparently not disingenuous and simply forgot that the shareholders aren't local. Or even live here 6 months out of the yea. "Support your people before you support somebody else" - 1980's BVI calypso. We haven't come very far since then apparently. It's not even THE corporate name! I don't know why the Premier insists on calling it BVI Airways. 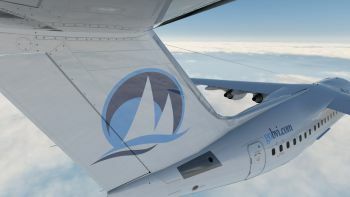 The corporate name is BV Airways. There is absolutely no 'I' in it. He needs to do his research. So, if he gave $7 million to BVI Airways, Inc, then that money is gone bye, bye. So who are these investors that Dr. Smith is fighting so hard to please? ..... Heard through the grapevine that Dr. Smith's boss lady has a vested interest....could be why the finance minister was so quick to hand over that 7mil.... And when it comes out... its too late. PEOPLE OF THE BVI DEMAND TRANSPARENCY - Government - TELL US WHO THESE INVESTORS ARE. Good point. I do not understand why VI Airlink did what they did. If the process is delayed then all our money would be gone. To me it is a selfish move. Selfish and self defeating. Most definitely not capable of serious responsibiitu and his own airline is in survival mode with welfare from the Gov . Seemingly not a bright tool at all. Look how low the PRRMIER of the BRITISH VIRGIN ISLANDS do to destroy a local. What the government should have done is to help the local company to air lift the people to and from PUERTO RICO and then move up to straight flights. I wonder if he think the USA is please with his tactics . He should be a shame of himself . MR PREMIER you will reap what you sow. What this government will do next to help outsiders? WOW! "there is a leak in the complex"
Wha call this 73 year old man up at midnight pass he bedtime. Who really listens to ZBVI at midnight anyway. Nothing wrong with the letter the Primier is defending the tax payers money. Where does vino get all these leak info from? All I need is to be able to go to St Marten, Puerto Rico, St Kitts for less than $250.00...It's all about Greed... They all are fighting for our money.. Yet Air transportation is so expensive....Where is the fight to get the cost now.? Who remembers when we had direct flights to Florida? Oh, and it was a dismal failure. I see the premier setting the record straight not fighting anybody. This reminds me of ocean comversion reaping the sweet and only realizing they can do certain things once biwater came in the picture. Everybody with this killing local business talk.When VI Airlink did what they did do you think they had country in heart? If the application is delayed who will it benefit? We will be left holding the bag.We have to look at the bigger picture, the BVI is not an easy place to get too. Yes it's easy to say develop the ferry terminal but which one of you will be going to a new destination and have to dedicate 2days in travelling to and from, not to mention you only have one week vacation. Non of you will do that lets be honest. What else could the government do? I personally feel that VI Airlink is over reaching. They claim that they wanted to do the same thing but ask the question with new planes it would have been 4 times the cost. I support locals getting the first go at anything but sometimes the government will make unpopular disscions but they have to be made. It all comes down to transparency. Just like everything else with this Government they continue to conceal their dealings when it comes to the people's purse resulting in mistrust and situations like the one that presents itself. So you take 7 million of the people's money and give it to a foreign company without bothering to divulge the terms of the deal and the shareholders of this entity to the people. If VI Airlink and Inter Caribbean did not file for the objection certificate then that information would not have been released. As it is we got the terms and conditions of the deal from a foreign organization in the USDT. Imagine that? That is unacceptable for any Government much less the one that once represented itself as;"Government in the Sunshine". We now know that the deal provides that the Government is required to exempt the carrier from having to pay any landing fees, airport authority fees, navigation charges, storage fees, parking fees, lighting fees, fuel taxes etc. just some of the concessions. All this for a private entity whom we do not know who are the shareholders are and it is reasonable to assume that none are BVI Islanders. It is not a level playing field when one airline gets all these concessions and the others get none. I am all for more airlift solutions but not if it is not transparent or if proper due diligence is not observed. Not if it means that the BVI people will have to get the short end of the stick and that BVI companies who have invested so much of their hard-earned money will not be able to compete because of unfair advantages created by their own Government. Come on Man! maybe its time for the premier to out VI air-link..maybe they are not serious about growing their business to put the necessary mechanisms in place to have an effective business.usually if that's the case people will not invest or pull away. 7 million is a lot of money to put into a business which has no intentions to grow or enhance their business,which will ultimately lead to failure. there is always 3 sides to a story, maybe the premier should really put the facts out there, then again it makes no sense destroying a small local business to prove the truth, however VI airlink should come clean and speak the whole truth not just pull the victim card. Did you dream this last night? Clearly you don't expect anyone to take you seriously. VI Airlinks just file a complain at trade for the kick. If trade ignore you sue them on the grounds of not following their own policies as it relates to how and who licenses are issued and jeopardizing local businesses. Local businesses are tired of being fought and left behind in our own country. VI Airlink didn't do anything. The " Givernment" did. BVI Airways did. On a serious note tho, if these allegations are true of this Premier then he should resign immediately and clear his name then come back if needed. These are rather serious allegations!